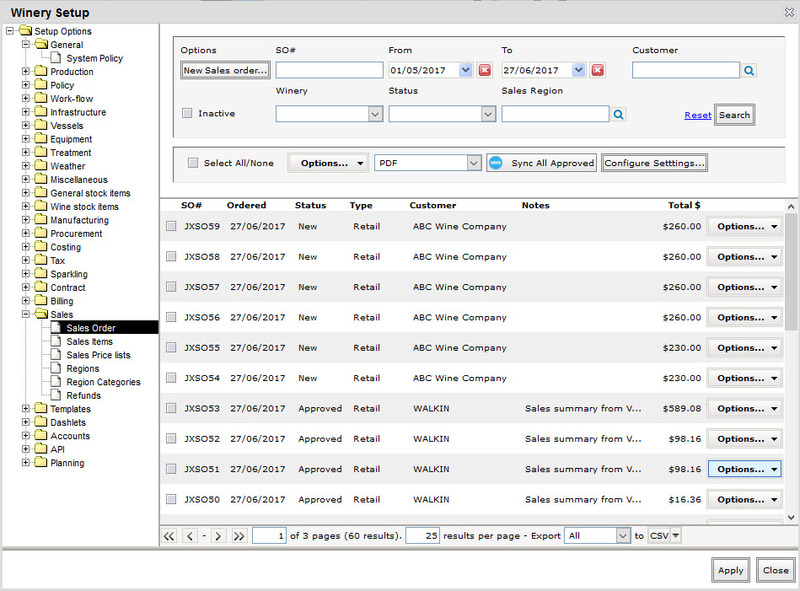 To create/edit a sales order in vintrace, head into Winery Setup > Sales > Sales Order. The search form has some notable features. At the top are various search fields, which can be cleared with the Reset button. Just below that is the multi-select action bar. 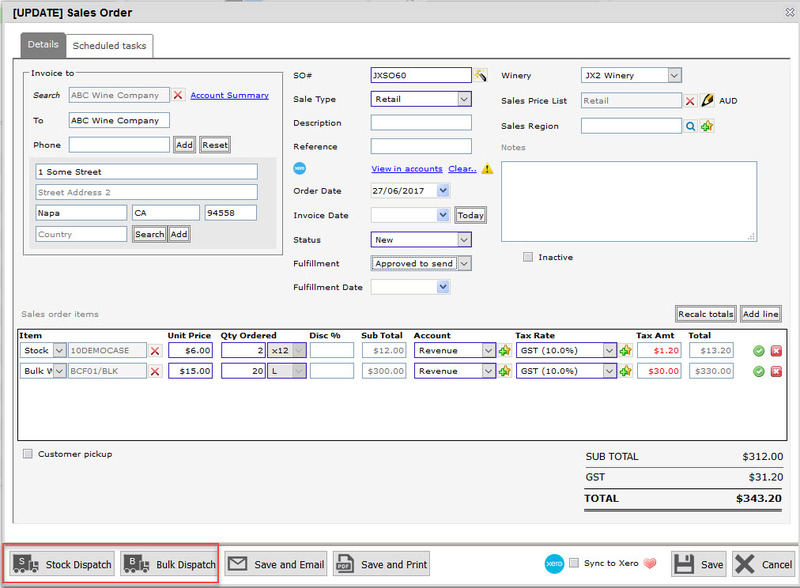 With a select all/none checkbox and a menu button to select a operation to perform on all selected Sales Orders. Next to that is the Print Format to use when generating reports/csv files. The table of sales orders has a checkbox next to them for the multi-select options. They also have their own individual option menu button. 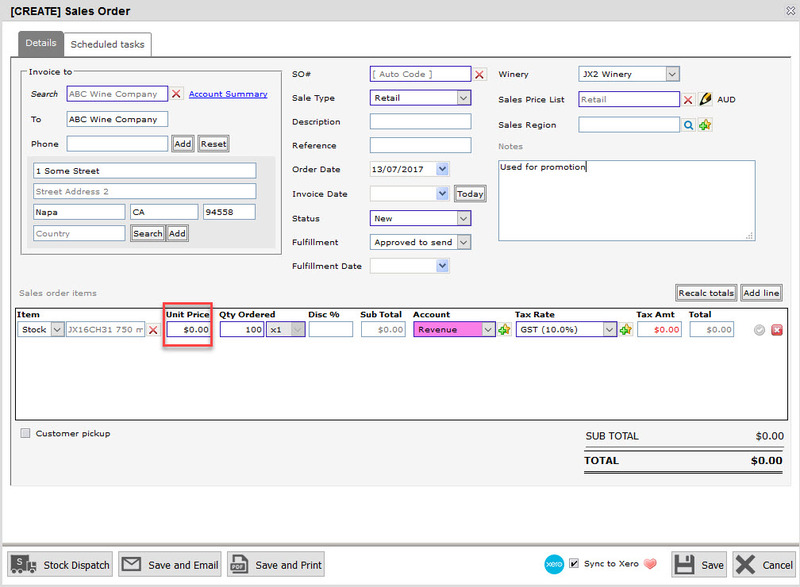 Clicking on Options allows you to make the following operations against the sales order: Stock dispatch, Bulk dispatch, Sync to Xero (if accounting integration is enabled), Copy, Email, Print, or create a Return/refund (this is only applicable for approved sales orders). Invoice To – holds the customer information, that is to say the purchaser of your stock. Sale Type – defines the type of sale, should the tax differ based on the purchaser. Examples would be the WET tax for AUS, GST for NZ, VAT for the EU or state/local sales taxes in the US. View in accounts – clicking on this link will take you to the linked invoice in Xero. This is only for sales orders that are linked to Xero (accounting integration is enabled). Click here for more details on syncing sales orders to Xero. Order date – the date the sales order was raised. Invoice date – the date the invoice was carried out. Status – is the stage the sales order is at. The flow of states is usually New – Approved – Payment in Progress – Paid. Fulfillment – fulfillment status of the sales order: Not approved to send, Approved to send, Partially sent, Fully sent. Fulfillment date – the date the fulfillment was carried out. Sales price list – determines the prices used for items. Item – type of item and the name. 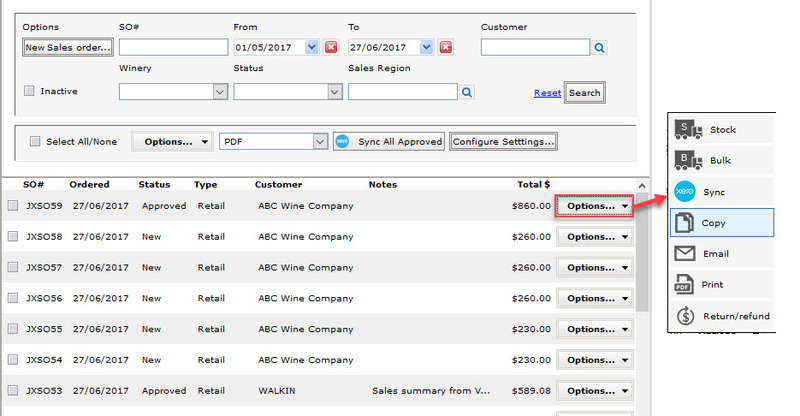 In the sales order items, there are four types of items that can be added: Bulk item (the Item is linked to bulk stock of a wine batch), Stock item (the Item is linked to a stock item), General item (the item is a generic item), and Adhoc item (the item is a generic item that does not exist yet but that you want to add now.). Tax rate – defaults to the Price Lists tax rate (if it has one set). Customer pickup – option to indicate that your sales order is a customer pickup and vintrace will automatically perform a stock dispatch for the sales order once it is saved as approved. Click here for more information on this option. To create a sales order for samples and promo stock, enter them with $0 unit price. 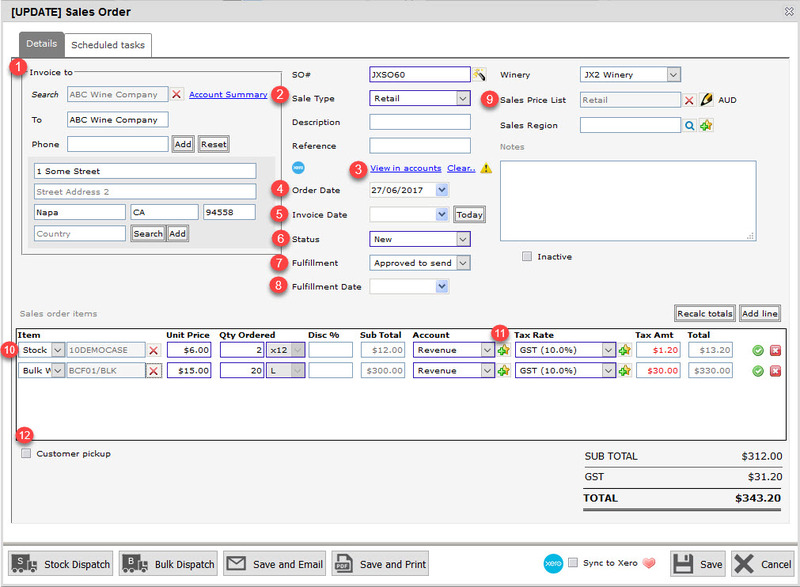 From the Sales order, you can perform a stock dispatch or a bulk dispatch by clicking Stock Dispatch or Bulk Dispatch. Please see this article on configuring Xero integration.